1. Importune prayer is never discouraged. Verse one begins by telling us what this parable teaches: “that men always ought to pray and not lose heart.” This was the attitude of the widow in the parable; thus, with this attitude she kept coming back to the judge. She did not get discouraged when the judge at first denied her. No, she kept coming back with renewed energy; and the judge was the one who got weary! Importune prayer then is prayer that has strength of heart; it never faints, never grows weary, and never gets discouraged. 2. Importune prayer is prayer that would wear out and trouble any person of this earth. Here we see that the woman was so persistent that she troubled and wore out the judge by her continual coming and asking. Now I don’t believe that our objective in prayer is to wear out God or to trouble Him. That would be impossible. But nevertheless, this is what importune prayer is; it is a prayer that would trouble any person on this earth—as it did the judge. But even though God is not going to be troubled by our persistent prayer, He always knows our heart, recognizes our need, and is touched by our persistence. For that reason, He will give us what we ask for even more speedily than the judge gave to the woman. For if the cruel and unrighteous judge gave justice to the strange widow who was persistent in her asking, God who is fair and righteous will surely give us, who are His children, what we ask for when we pray with importunity, and even more speedily (v. 8). 3. Importune prayer is prayer at all times, even in difficult times. Just before Jesus gave this parable He was talking to his disciples about the last days and about living in a time of great difficulty. I believe these are the last days (the age of the church), and so this parable is directed at us, that we ought to pray at all times, “day and night” (v. 7). This of course means that we should pray for urgent things over and over again, but I think that Jesus also means that our heart should be continually lifted up to God. Hence I believe that importune prayer is prayer without words, prayer of the mind, or having a mind that is always set on things above (Col. 3:2). 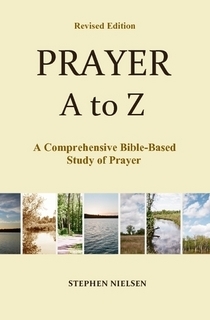 This entry was posted in Importune Prayer, Prayer A to Z Excerpts and tagged last days, Luke 18:1-8, prayer. Bookmark the permalink. He was reminding me, that the enemy will not win this battle. He has not forsaken my prayers. He hearing me, but still, Lord it’s not enough. I’m not satisfied with this. I need more of an answer. More of an understanding on the delay. Then, as I was studying this morning I came upon the term Importunity in Prayer, which led me to your site. Then I realized, the Lord was teaching me something. My cries are not in vain, but leading me to a more in depth understanding of God’s will and a heart to pray even more. Thank you for your teaching, and may it speak to others as well. Thank you for your comment. I’m encouraged by your persistence in prayer. Prayer is warfare isn’t it. We can’t let up. But there is also joy in prayer–because we are in His presence. When we feel discouraged in prayer we can take heart that He is listing and He cares. And He cares for your friends too. I came here after listening to a guess of Sid Roth, Mr. Steve Hannett. He spoke of the this opportune prayer and I looked it up. So I landed here and so happy to read your write up. Really lifted my spirit especially the comments made by P.B. above. I love you. Susan, Happy to know your spirit was lifted. Pray indeed is a continual process. It is continual trusting. We should never stop praying for what we need and desire. God bless you. I am glad to help. We can always go to God’s throne to find His help.